The Rubik's Cube, also known as the Magic Cube or Witchcraft Cube, is a torture device sold across the world on the basis that it is an affordable and vaguely entertaining cause of self-mutilation, as opposed to expensive alcohol addiction or social problems, the long term effects of which are somewhat over-the-top in comparison to the state of a person following the years during which they voluntarily attempt to unscramble the device. The Rubik's Cube was invented by the Hungarian architect Ernő Rubik during a particularly lonely stay in his city apartment following the collapse of an apartment he had designed not a year before. Based on the autopsy of his late cat, it was determined that he had spend two months designing and building a prototype of the Rubik's Cube, and his body had gone missing two hours later. For those without comedic tastes, the so-called experts at Wikipedia have an article very remotely related to Rubik's Cube. 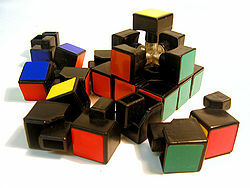 Due to lax Hungarian copyright laws, a friend immediately sold the Rubik's Cube prototype to a local company, who in turn made worldwide profits following the cube hitting toy store shelves across the world, and then doubled its intake by investing in global funeral companies. Since then, Rubik's Cubes have become a fundamental plaything in Western civilisation (the individuals of poorer countries simply cannot afford to waste their time in this way), with some experts estimating that every basement in America has at least 40% of an intact Rubik's Cube. Its attractive qualities make the Rubik's Cube what some refer to as "the perfect toy". Regardless of whether this is true or not, it certainly is notable for inhabiting the dreams of children everywhere, a feat few objects accessible before bedtime have yet to achieve. The Rubik's Cube itself is manufactured in a variety of ways: 2x2x2, 3x3x3, 4x4x4, 5x5x5, 6x6x6 and 7x7x7. As the dimensions increase, the nerd cred (similar to street cred) gained from solving it exponentially increases. Each visible side of the Cube is covered with a sticker of a certain color. The squares themselves rotate around a central core. The "objective" of the "game" is to make each of the six sides of the cube have all the same colored stickers, though this can only be done by peeling off the stickers and putting them in place. Humans as a whole are a highly competitive race, and Rubik's Cube solving competitions are an outlet for such competitive nature. There are several types of competitions centered around Rubik's Cube solving ranging from the inane to the insanely inane. The actual current world record for speed solving is held by Mats Valk with a time of 5.55 seconds who, incidentally, also holds the record for highest number of years gone without companionship. It is to be noted that a faster time was recorded at the Semi-Bi-Annual South Austrian Cubing Cup by a colorblind man named Ronald Dean who "solved" the cube in 4.29 seconds. The final configuration of squares was incorrect, but feeling incredibly sorry for the man, they awarded him the record. To this day, Dean is still under the impression that he is the Garry Kasparov of the cubing world, and has several books on the New York Times best seller list, most of which were purchased out of pity. Over time, various solutions have made their way to the public through literature, word of mouth, and the internet. Many believe that not figuring out how to solve the cube by oneself is a form of cheating and that the only way to truly "win" is to discover the solution by yourself. However, it is hard to determine who the "real" winner is, when it is taken into account that one of them wasted weeks of human life playing with a plastic toy, to achieve the same result as one who spent a couple of hours surfing the web. 1x1x1 Rubik's Cube: The hardest Rubik's Cube of them all. 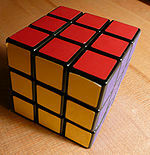 Zen Cube: Identical to a standard Rubik's Cube, except that all of the sides are the same color. Sudocube: A Rubik's Cube with no colors, but with a sudoku puzzle printed on the outside. The National Psychiatric Council names the Sudocube as a direct factor in 15,000 cases of violent insanity in April alone. Sudden Death Rubik's Cube: A Rubik's Cube with a timer activated as the first block leaves starting position. If the user has not solved the cube within a set amount of time, the user suddenly dies, usually by spontaneous combustion. Rubik's Pyramid: The tetrahedron version is significantly harder to manipulate.